The following are our lions (kings, studs, male parents). 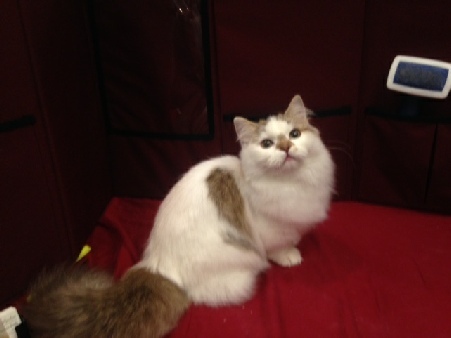 Since we are a small cattery to ensure good socialization of our cats, we will only keep one male in the house. Contrary to popular belief, not all intact males are problem sprayers. By keeping only one male in the house, we limit that problem. On a rare instance, we have used a stud to diversify the gene pool in the breed and to give our mature girls a chance to have litters while our boy was growing to maturity. However, at this time, we have our own male to produce kittens from our own lines. All of Tiny Lions Napoleons cats have been PKD tested and proven negative. They were also tested for Progressive Retinal Atrophy and Muccopolysacchiridosis and do not carry the disease. Test results are available for review upon request. Claude is our only male stud and he is truly a lover. His eyes are a beautiful golden. He has chocolate and is a carrier for Siamese color points. He is such a pistol. He is quite the lover boy. He is a currently a quad-grand champion in TICA. Click here to see Clawed Lemiuex’s past litters. 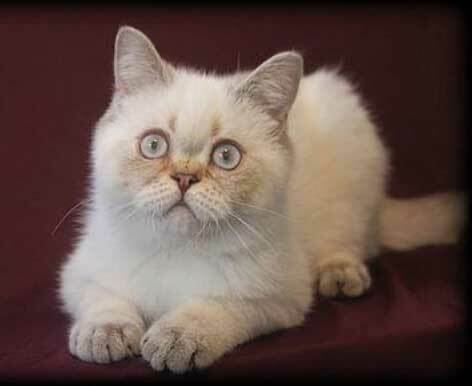 Riddler is a sweet non-standard Minuet who was graciously loaned to us from Samantha McConnell of Pawcity Cattery, to begin our breeding program with our girls, while Claude matured. He is a gentle boy who loves to snuggle and craves human companionship. He loves playing and has a wonderful temperament. He has an insatiable appetite for running around and fun. Click here to see Riddler’s past litters.